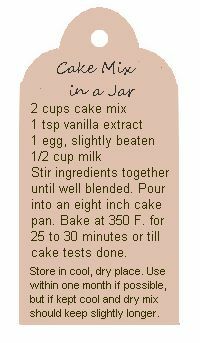 This is a nice gift in a jar to give at any time, but makes a special going away treat for college students or a welcome gift for a new neighbour. Print and cut out the gift tag. 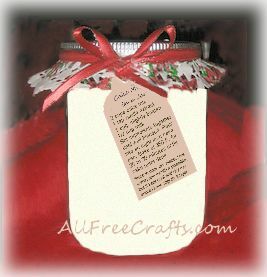 Punch a hole in the top and attach to the jar with a piece of yarn or ribbon. Stir ingredients together until well blended. 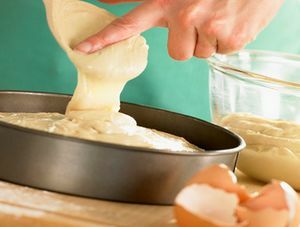 Pour into an eight inch cake pan. Bake at 350 degrees F. for 25 to 30 minutes or until cake tests done. 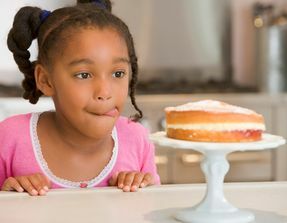 For a two-layer cake, double recipe and use two eight inch cake pans OR a 9 x 13″ pan and bake at 350 degrees for 25 to 30 minutes or until cake tests done.